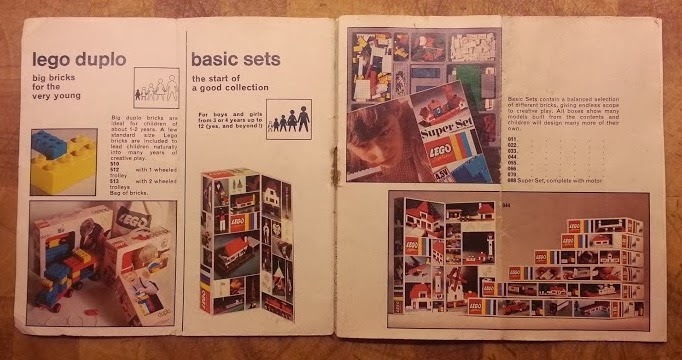 This Christmas, neat and safe amongst my other gifts, was a real treasure for me - the Lego System Collectors Guide To The World Of Lego from 1971 - the year I was born. 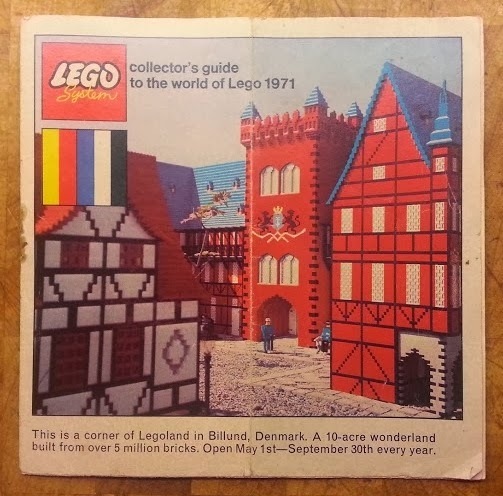 Nowadays we're used to a huge catalogue and other leaflets and magazines, but back in 1971 there wasn't so much printed material for Lego lovers, so this is a really special thing. The format is a small full colour booklet just less than 14cm x14cm with only 12 pages in total including the front and back covers. It's a bit yellowed and faded with age, I've retaken the photo's 3 times and this is the best I can do I'm afraid. 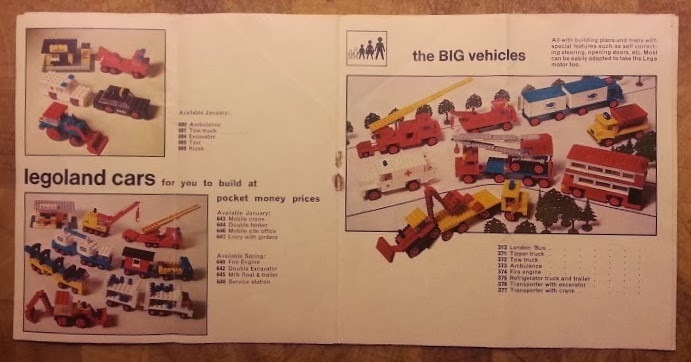 The first inside page starts with Duplo "big bricks for the very young" and I do remember the days when Duplo sets came with a few standard Lego bricks "to lead children naturally into many years of creative play". After Duplo we see a selection of basic sets - the contents of which were beautifully arranged in little plastic trays. 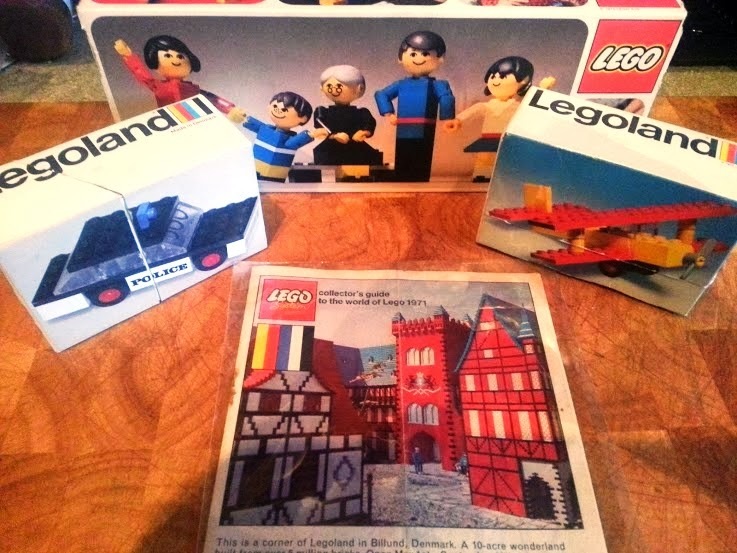 A brand new Lego set was a very rare sight when I was a child. I thought you had to be a millionaire or on the TV to be able to afford one. 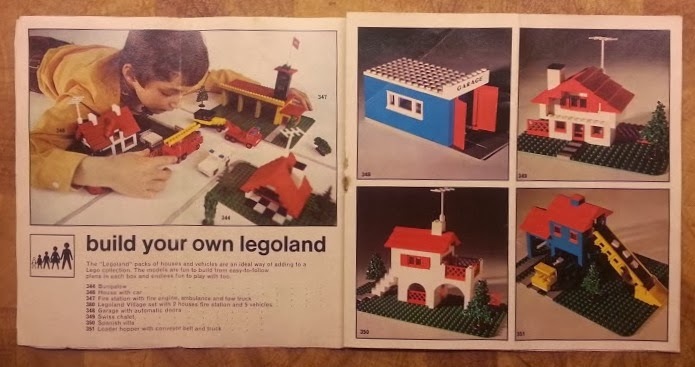 Houses really were my favourite thing to make, I knew what bricks I had and how tall my house could be and I made improvements to my design each time, I think I would have been beside myself if I'd been given one of these sets for Christmas. Back in 1971 vehicles were limited to a few base plates, bricks and slopes and every vehicle had no space for a passenger - however there were still plenty to choose from and each one was very distinct and different from the other - and far more easily copied using the bricks you already had at home. I had the small white ambulance in the top left photo - I loved it. Motors were already available for the older and more adventurous enthusiast, with a wired remote control so that you could move alongside your vehicle and gaze in awe at the sight of it moving by itself. There are also the beginnings of what would become Technic Lego - rods, gears and bars with staggered holes - although at this point they had not yet moved right away from your basic 'brick' shape. 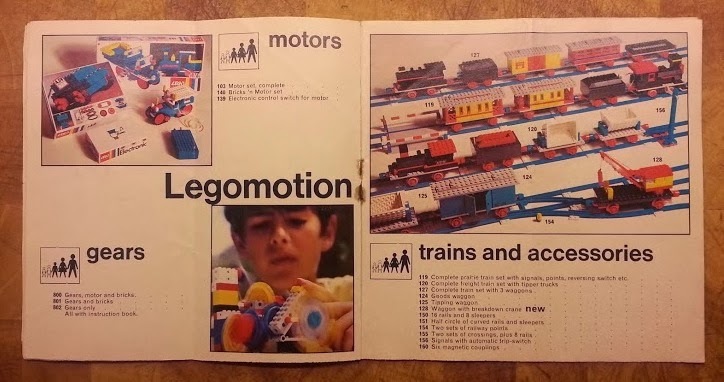 Trains have always been popular Lego sets and it was true in 1971 too, with a huge array available. Built in a similar way to the other vehicles, cone shaped wheels with a flange at the rear hold them onto the blue track and they work incredibly well. The track was great on a straight flat floor, a lot less forgiving around corners and on carpets! 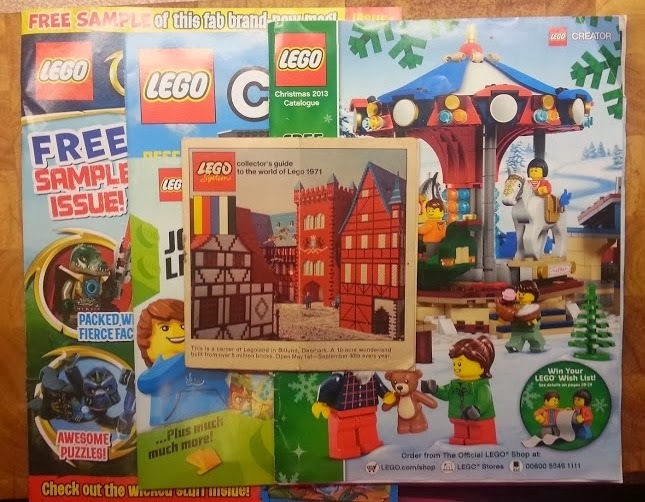 I remember staring at supplementary packs hanging up in my local toy shop and wishing I could buy lots of the bevelled red bricks so that I'd be able to make an entire roof from Lego - one of my over-riding memories from my childhood is never having enough bricks to make more than a hint of roof! 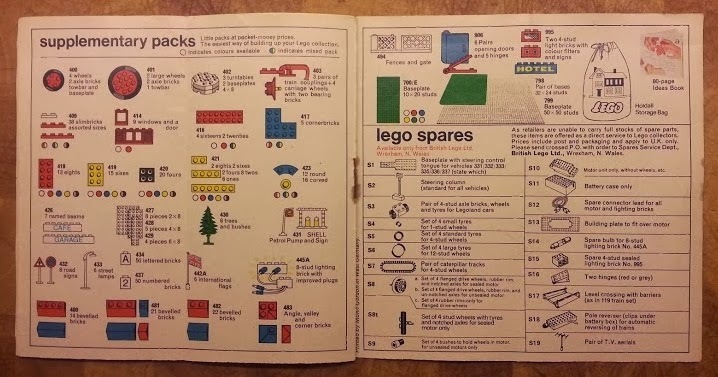 All the Lego Spares in the book were not generally available from your retailer, they were offered as a direct service to Lego collectors from British Lego Ltd of Wrexham and included part S15 - a spare 4-stud sealed lighting brick no.995. As a child I saw these bricks and thought they were made of magic - I was an adult before I saw one lit up! Wow bet you loved that! Looks like it is in such great condition, it must have been well loved. Ah, what a fantastic gift. wow! that is amazing! I love lego! I have never seen them before! Great find! 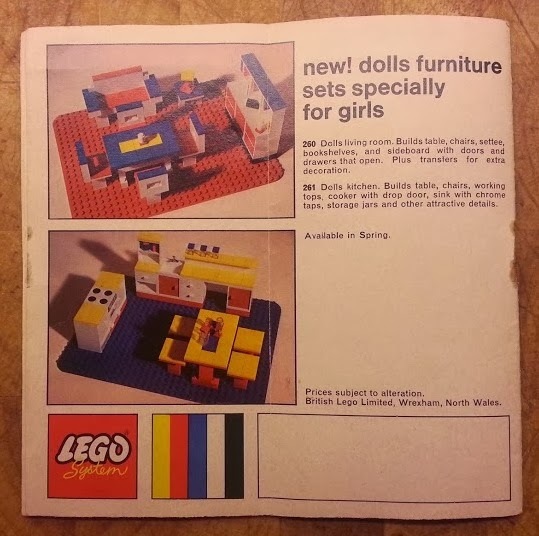 I too was born in 71' but I don't remember these booklets. Although now I have seen this I do vaguely remember having a little kitchen like the one in the picture. I don't know what has happened to it though. what a great gift, and something to keep. It all starts coming back... :D I bet you played with those figures too!